Produced at Pinewood Studios, London, England. When the Monsignor visits the tiny village near Castle Dracula, he finds that, although it is a year since the Count was destroyed, the villagers are still living in fear and that the local priest has said mass to an empty church. Outraged by their attitude – “There is no evil in the house of God!” – the Monsignor insists that the priest accompany him to the castle, where he will perform the service of exorcism. They set out up the mountain, but eventually, overcome by fear, the priest will go no further and the Monsignor ontinues alone. As he reads the service and seals the castle door with a huge crucifix, a terrible thunderstorm erupts, causing the priest on the mountain to stumble and fall. He cracks both his head and the ice of a mountain stream and his blood trickles down on to the lips of Dracula, whose body lies entombed in the ice. 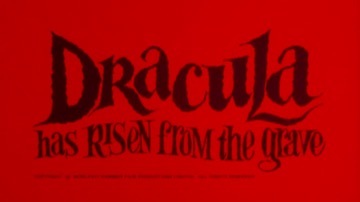 As more blood flows into his mouth, Dracula’s lips begin to quiver…. Actor Rupert Davies was famous in the sixties as BBC TV’s “Maigret”. His films include “The Brides of Fu Manchu” (1966), “Witchfinder General” (1968, with Vincent Price) and “Curse of the Crimson Altar” (1968, with Boris Karloff and Christopher Lee). Veronica Carlson proved to one of Hammer’s most durable heroines. She also appeared for them in “Frankenstein Must Be Destroyed” (1969) and “The Horror of Frankenstein” (1970). She can also be seen in Tyburn’s “The Ghoul” (1974, with Peter Cushing). Christopher Lee’s disillusionment with Hammer’s treatment of the vampire count seems to have its roots with this film and he has made no secret over the years of the fact that he strongly disapproved of the scene in which Dracula, staked through the heart, does not die. His objection was that everyone knew ‘that a stake through the heart meant the end for any vampire, but he was overruled and the scene remained. Having completed shooting, Freddie Francis apparently went on holiday for a couple of weeks. On his return, he discovered that the film had been edited in his absence and was ready for release! To obtain the unusual colour effects in this film, Freddie Francis lent Arthur Grant the filters which he had used while photographing “The Innocents” (1961).